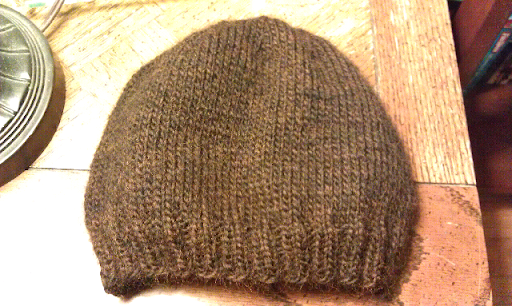 I wanted to knit a hat that had a really fun design... but it came with no hat pattern (just the design chart.) Instead of looking up a plain skullcap knitting pattern, I decided to design my own. Why bother designing my own version? I plan to use this hat pattern as the template for future designs. It is easier for me to have the knitting kinks worked out before I start adding complex colorwork. Gauge: 5 st/inch; 7 rows/inch over stockinette. Cast on 100 stitches on size 6 needles. Join to knit in the round and knit 8 rows of 2x2 ribbing (~1 inch). 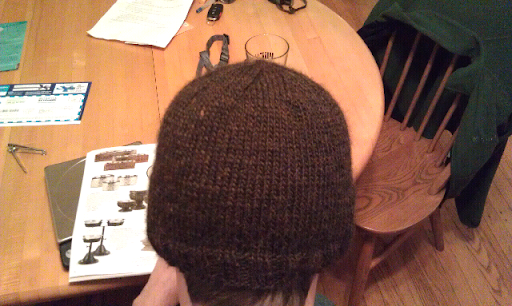 Note: 2x2 ribbing is *K2, P2* across the round. Knit 33 Rows or until piece measures ~6 inches from the cast on edge. My husband reading while wearing the hat. This was my first time knitting with Berroco Peruvia yarn, and I have to say that I LOVE it. The fabric has a really rich feeling. Just an advice, I think you should change your background pattern or style of your website, so that it's more inviting. I think what your doing is really great, but it's hard to even look through your site when the fonts are really small and the whole feel of the page is gloomy and dark. I just stumbled on your page and didn't feel like looking through to much because of the above. Hope this helps. Thank you for your comment. To be honest, I do sometimes regret my theme choice. I am working on a site redesign that should address some of your concerns. As long as you cast on a multiple of 4 stitches, the K2, P2 ribbing should line up correctly. Are you getting 5 sts/inch over the ribbing or stockinette (every row K in round, or K on right side P on wrong side flat)? The gauge should be measured over stockinette. I have been making these hats (http://webhome.idirect.com/~quanah/patdoublehat.html)for a few weeks and wanted to do something with the leftover wool. Then I remembered skull caps and did a search for one, lucky me I found the one I remembered... YOURS!! I just made one, it took up all but 3' of my leftovers so wanted to say thank you for the perfect hat. So easy and quick, made one in just over an hour. Thank you !! I'm glad that it turned out so well. You're very welcome! Up on my Toolbar is where Zoom is found -- and making that larger means that ChemKnits font is larger. I don't know why I didn't think to do the larger size. But now I have. Yea!! Are the size 6 needles US sizes or metric? I used US size 6 needles (4.0 mm) for this pattern. LOVE THIS! Thank you for making it available. And thank you for the encouragement and advice, as well. how long are the size 6 circulars supposed to be? I like using 16 inch circulars for hats, and then switch to dpn's for the decreases. My KnitPicks Options needles have VERY flexible cables, so I will often use 24" circulars for the entire project, using a variation of the magic loop method when the project gets too small. LOVE your site. It has been so helpful for me as my Knitting skills become more advance and it has inspired me to create my own patterns. Many thanks. I was wondering though - I wanted to use this skull cap pattern, but the person I am knitting for usually wears hats with a 23 inch circumference (fitted hats he wears are 7 5/8 American Hat Size). I'm not sure how to increase the stitch count to include the 3 extra inches or if I really need to. Any suggestions would be appreciated. I would increase the stitches cast on by 10. This will give you an extra 2 inches if you gauge is 5 sts/inch, and then the decreases will still work correctly (you'll be decreasing 11 sts a row rather than 10). The ribbing will have a 4 knit stitches in a row, but that is okay. The hat is stretchy, so you want it to be an few inches smaller than the head you're trying to fit. Another option would be to use a slightly thicker yarn. if you have 9 sts/2 inches, then you will have a 22.22" hat. Yay!! Kerri asked the same question I was going to ask!!! I wanted to thank you for posting the generic skullcap pattern for free. 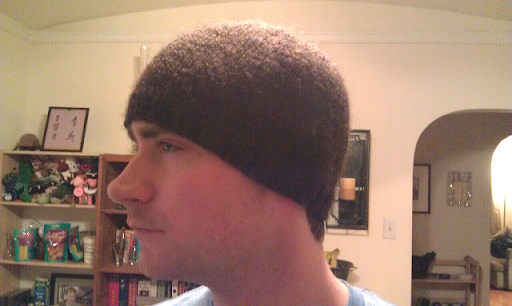 I've just finished my first hat and it yielded a perfect result. I am now on my second hat and hope to knit more of this pattern in the future. Sheriel, You are very welcome! I'm glad that your hat turned out well. Happy Knitting! I'm in the process of making your Patriots hat for my Son. After a very rocky start, I'm on my way. When I changed to straight knitting, I kept going the wrong way. Put it down and forget. Gotta love these senior moments. Thanks so much for the pattern. My Son is excited!! Awe. I hope that I didn't have an error in the pattern. I hope it turns out awesome in the end!